Kickstarter is a crowdfunding platform for creators to share their ideas to the world. Ideas are worth a million. You maybe having artistic energy bubbling inside you, but if your bank account is empty your creativity will have to be subdued. You will have to limit yourself to a day job and act as if you don’t have a film or a screen play all worked out inside your head, just waiting for the right funds to bring them to a solid reality. Kickstarter could be your key that unlocks your dream closet Kickstarter as the name suggests is created to provide a Kickstarter to the project of your dreams. This American company located in Brooklyn of New York was launched in 2009. Thier founders are Perry Chen, Yancey Strickler, and Charles Adler. Since then Kickstarter has experienced a tremendous growth and success. In this article, I would like to give you a broad overview of this crowdfunded platform. Kickstarter is funded by the public to create innovative projects that will benefit the public. Thier mission in their own words is to give life and breath to creative projects. 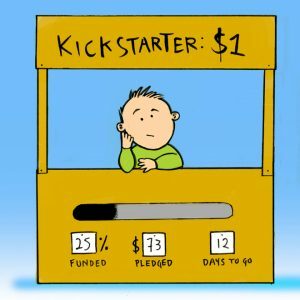 Are you a Creator of a Backer? Armm…Who are they? “Backers” are those who fund back up the projects of the creators. They can come from any nook and corner of the world. There is a community of 10 million people, joining hands to fund these awesome projects. Their pledges will be rewarded by Kickstarter as well. The creators have to come from the following countries: United States, United Kingdom, Australia, Canada, New Zealand, Denmark, The Netherlands, Ireland, Norway, Spain, Ireland, Sweden, France, Germany, Austria, Luxembourg, Switzerland, Italy, Belgium, and Mexico. Creators propose a project and select the lowest funding budget and a closing date for fund raising. If the amount of money is not attained by that date, no funding is collected. This assures your funds go to the respective project only. The Backers are advised to choose carefully the project they are funding, according to their whims and wishes. 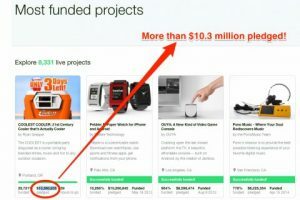 Kickstarter gets a 5% fee from the total funds collected, but they don’t claim the ownership of these projects, unlike some of their competitors. There is a wide array of categories, specifically 13 categories and 36 sub categories to select from for one’s new artsy project. The 13 categories are as follows: Art, Film and videos, Comics, Food, Fashion, Dance, Music, Design, Fashion, Games, Photography, Technology, Publishing, and Theater. The major attractors of funds are film and videos, Music and Games. If you are thinking of being a Creator…. Kickstarter has backed more than 34,000 projects already. They have the experience to serve you. Some of their noteworthy, successful projects are Pebble time smart watch, “The Coolest Cooler” ice box project. Double Fine’s adventure game. Their projects get selected to Academy awards and one has even won an Oscar. (Isn’t that amazing?!) So you are in safe hands. They are a well-oiled machine, with guidelines and rules pertaining to the projects, so that the product is earth friendly. Overall, Kickstarter is a great place to pledge your support to a budding artist, if you are a creator, for you to get financial backup. We have discussed the pros, moving on to the cons now. Sometimes the projects don’t turn out as well as backers expected. Poor outcome in a project they have invested in may cause dissatisfaction and litigation issues. Sometimes projects fail due to underestimation of the budget and the feasibility. At the same time, there are issues of streaks of corruption and rise in the number of paid advertisements. History states there have been patented infringement disputes in certain Kickstarter projects as well. Also, there are times where Kickstarter administration has canceled projects due to claims of fraudulent, unrealistic performance, plagiarism or displaying inappropriate subject matter. Other crowdfunded companies similar to Kickstarter are Indiegogo, RocketHub, FundRazr, Pozible. Indiegogo is the biggest rival of Kickstarter. The big difference between the two is that Indiegogo offers the option to collect the money even if they don’t reach their fund raising goals. But in these cases, Indiegogo gets a comparatively larger share of the money. All in all, Kickstarter is a great hub for creators and supporters to come together. Though there are lots of new companies emerging in the crowdfunding arena, Kickstarter remains the most popular and substantial corporation.